They are not the most obvious tour mates, a decade separating them in age and an even wider gulf in genre dividing their respective catalogs. 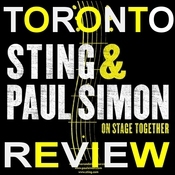 None of that was lost on Paul Simon and Sting when they came to TD Garden Monday night. If anything, their differences were a badge of honor, proof that good music and excellent musicians playing it transcend boundaries. "Welcome to our merging of two bands, two different repertoires, and two different singers who sound pretty good, actually," Simon said early in the evening, with an arch of his eyebrow that suggested that even he was a little surprised by their chemistry. If Simon and Sting share anything, it is the fact that they have given pop music some of its most infectious hits, which rang out in thunderous unison at the Garden. Sting hit his stride with a far-reaching set, dipping into his discography with the Police ("Every Little Thing She Does Is Magic," "Message in a Bottle," "Roxanne") and his solo work ("Englishman in New York," "Desert Rose"). They opened the show together, flanked on either side by their bands, and steamrolled through three songs: "Brand New Day," "The Boy in the Bubble," and "Fields of Gold," swapping verses and rarely letting the seams show. Sting then did a block of songs solo, followed by Simon doing the same, and so on for two hours and 40 minutes. Simon, who released his first album with Art Garfunkel in the early 1960s, when Sting was a teenager growing up in England, was exalted as the evening's statesman of songwriting. "He simply has no peer," Sting said before paying his respects with a cover of Simon's "America." Simon, who is 72, which is notable purely because the guy is singing better than ever, was in incredible form, particularly on a deeply emotive rendition of "Still Crazy After All These Years." His last set of songs was blazing, from the rhythmic chug of "That Was Your Mother" to the dusky tenderness of "Hearts and Bones." A hushed intro for "Diamonds on the Soles of Her Shoes" gave way to sparkling Afropop guitar lines, trailed by another block-party anthem, "You Can Call Me Al." A three-song encore was a sly mix of crowd favorites: "Bridge Over Troubled Water" (with Sting's voice soaring beautifully into the stratosphere), "Every Breath You Take," and "Late in the Evening." Simon and Sting huddled with acoustic guitars for a parting encore of "When Will I Be Loved," a tribute to Phil Everly, who died in January. Their final bow was a deep one and a reminder that they had mastered that merging that Simon had mentioned earlier. And, yes, they sounded pretty good, no "actually" needed. 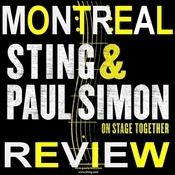 For more reviews from the Boston show please visit http://www.sting.com/tour/date/id/2902 where you can view the setlist, leave your comments about the show, post images of your ticket stub and your photos from the show!